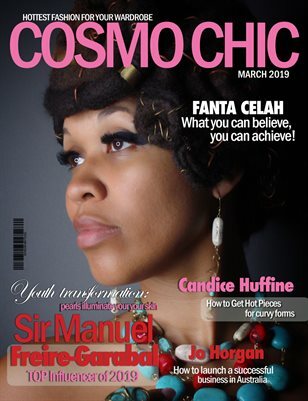 In this issue Fanta Celah tells about her art, jewelry line and lifestyle, Cundice Huffine has rewritten the rules on plus-size dressing, Sir Manuel Freire-Garabal shares his experiences and style, Audrey Soie discusses the fashion on scarves. You will also find our recomendations on wardrobe, jewelry. Will learn how to launch a successful business in Australia told by Jo Horgan, qet inspired by crazy Quinevere Q, whose scandalous interview you can find on the web page.